I'm sorry, but putting a highly toxic chemical into our drinking water to prevent cavities is 100% insane!! They say that it's in such small amounts that it's beneficial and that it wont harm you. Would you think it's OK to medicate someone without their permission? Well, that's exactly what their doing. 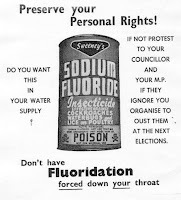 Water fluoridation violates the Nuremberg code for human experimentation. Look it up. It's funny how the "Fluoride Information Network" or the IFN claims that fluoride in the drinking water is really helping disadvantaged children and that some how it promotes health. Only problem is that they fail to explain how. That it's a long term approach towards solving problems. But again they fail to state what problems there solving. They claim it prevents disease, but they fail to mention what diseases they prevent. This next part is cut and pasted direct from there website.
" Making informed choices based on available evidence and its relevance to our community’s situation." - Notice how they say AVAILABLE evidence. "Recognizing that public health measures have been of great benefit to the community, but that they need to meet a high standard of safety and efficacy and should not constitute an insurmountable burden to those who object to them for personal reasons." -What the hell are they trying to say??? "and should not constitute an insurmountable burden to those who object to them for personal reasons" Give me a break! "Understanding that any policy involves a balance between risk, cost, and benefit." -They clearly state that it's a risk!! "Understanding that there can be no absolute certainty in public health matters, but that there are reasonable standards of evidence that most of our community can accept to use in making policy decisions." -So, there not certain as far as public health is concerned. I like how they say "reasonable standards of evidence" They are basically making their own rules. "Adding fluoride to drinking water is an important element in promotion of dental health along with education and access to dental care." -What?? How does water fluoridation promote education and allow access to dental care?? Are they claiming that fluoride in the drinking water is dental care?? OK, so now were going to talk about what other people have to say about water fluoridation, what it really does, and where these chemicals come from. 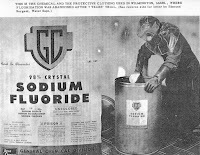 "I am quite convinced that water fluoridation, in a not-too-distant future, will be consigned to medical history...Water fluoridation goes against leading principles of pharmacotherapy, which is progressing from a stereotyped medication - of the type 1 tablet 3 times a day - to a much more individualized therapy as regards both dosage and selection of drugs. The addition of drugs to the drinking water means exactly the opposite of an individualized therapy." -Dr. Arvid Carlsson -Nobel Prize for Medicine winner 2000. (Heller et al, 1997 and McDonagh et al, 2000). In human studies the fluoridating agents most commonly used in the US not only increase the uptake of lead into the blood of children (Masters and Coplan, 1999, 2000) but are also associated with an increase in violent behavior. Most of these facts I got from the Fluoride Action Network witch you can find @ http://www.fluoridealert.org this is a huge website dedicated to inform the public about water fluoridation. The facts will blow your mind. -Sodium Fluoride: It is considered the reference standard to fluoridate the water. Sodium Fluoride is poison. It's been used in rat poison and a insecticides that kill cockroaches! - Fluorosilicic acid: It is a cheap liquid byproduct from phosphate fertilizer manufactures. Here's the label. It just doesn't make any sense. 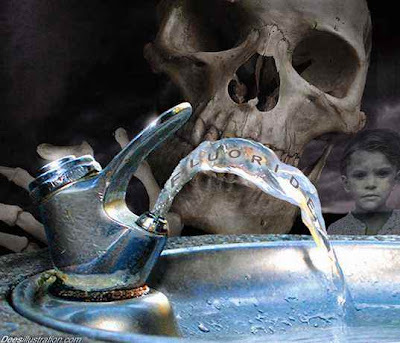 Why spend money to put fluoride in our drinking water, when statistics prove it really does nothing but harm people. Maybe this list of what can be caused by water fluoridation will shed a little light to what there doing. Why would anybody in there right mind put fluoride in our water? I guess the more issues people have, the more money there is to be made by the drug companies to fix those issues. It's a bit easier to control a dumber population. 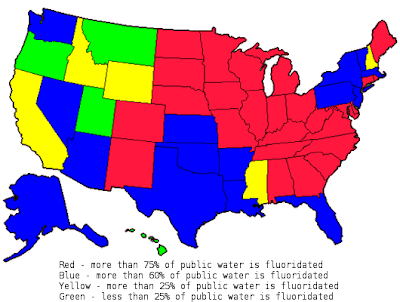 Here's a map to see how fluoridated your water is. I'm coming to find out fluoride is in a lot more things than just our public drinking water. It's in bottled water as well. It's actually found in most processed foods that you eat and beverages that you drink. Oddly enough fluoride is found in industrial waste, medications, household products, pesticides, freon, carpet and even the clothes on your back. One of the best sites I found on water fluoridation is @ http://www.delnortecleanwater.org Lots of great facts and it's a very strait forward explanation. How could this not capture your interest.